Long, sinuous, tendril-like structures seen in the vicinity of Saturn’s icy moon Enceladus originate directly from geysers erupting from its surface, according to scientists studying images from NASA’s Cassini spacecraft. This result is published online today in a study in the Astronomical Journal, along with additional insights into the nature of the structures. Under certain lighting conditions, Cassini’s wide-view images showing icy material erupting from Enceladus reveal faint, finger-like features, dubbed “tendrils” by the imaging team. 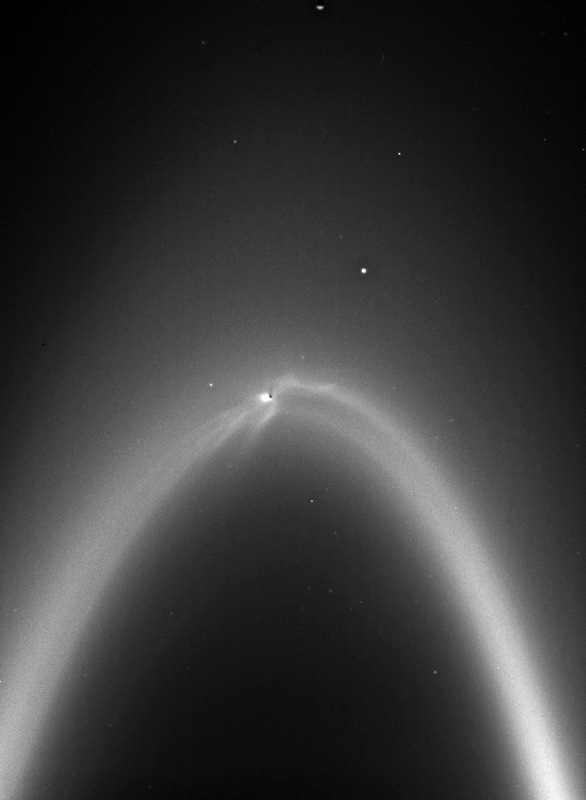 The tendrils reach into Saturn’s E ring—the ring in which Enceladus orbits—extending tens of thousands of miles (or kilometers) away from the moon. Since the tendrils were discovered, scientists have thought they were the result of the moon’s geysering activity and the means by which Enceladus supplies material to the E ring. But the ghostly features had never before been traced directly to geysers on the surface. The authors suspect that changes in the tendrils’ appearance likely result from the cycle of tidal stresses—squeezing and stretching of the moon as it orbits Saturn—and its control of the widths of fractures from which the geysers erupt. The stronger the tidal stresses raised by Saturn at any point on the fractures, the wider the fracture opening and the greater the eruption of material. The authors will investigate in future work whether this theory explains the tendrils’ changing appearance. Today Saturn is at western quadrature. The earth and Saturn are at a 90-degree angle from each other relative to the Sun. 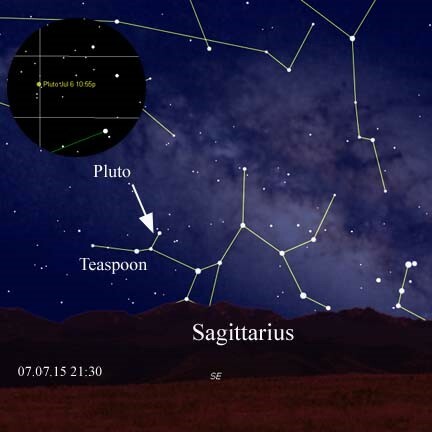 Quadrature occurs at 5:38 A.M. PST. Saturn will culminate (reach its highest point above the horizon) at sunrise today. This means Saturn is visible in the night sky for almost half the dark hours, rising at 01:05 and fading into the sunrise which occurs at 06:47. As the Earth catches up in our orbit, Saturn will be visible in the night sky during more dark hours. 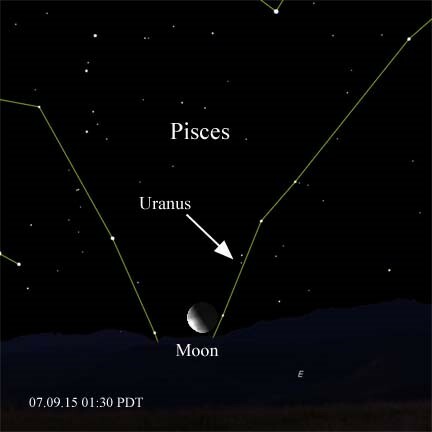 Crash Test: Have you been watching the Venus and Mars show the last several days? 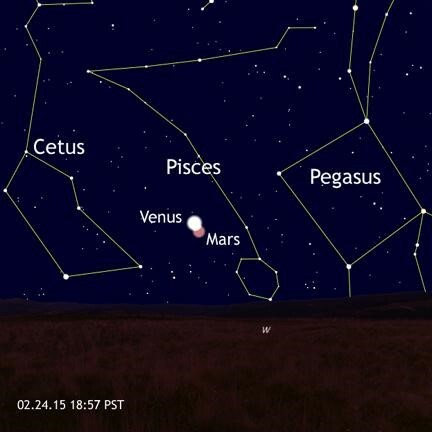 Mars was just above Venus last week, and has now moved below. Which planet is moving faster across our sky? The two are just under 1 and 1/2 degrees apart from our viewpoint, but separated by 0.815 AU (Astronomical Units) in actual distance. An AU is the measure of the Earth’s average distance from the sun, approximately 93 million miles. 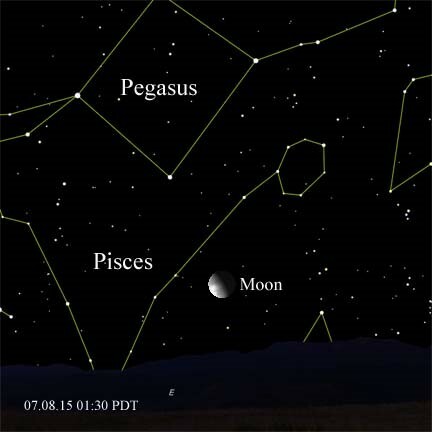 Today’s first quarter Moon is 1 degree north of the giant red star Aldebaran, in Taurus. 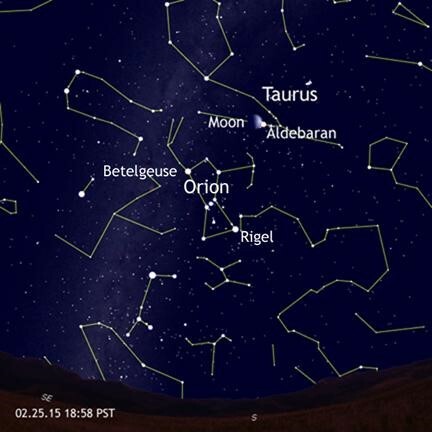 They form a striking pair set above the giant Orion, and its bright stars Betelgeuse and Rigel. 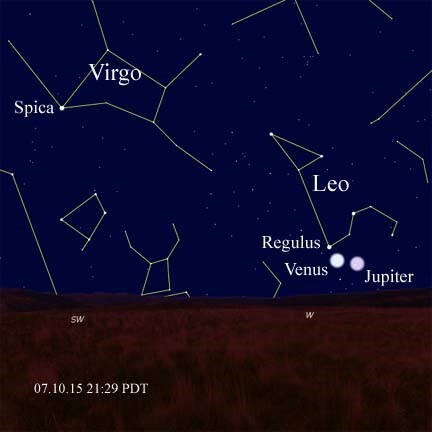 Early in the evening, you can also see Jupiter to the east and the pair of Venus and Mars to the west. 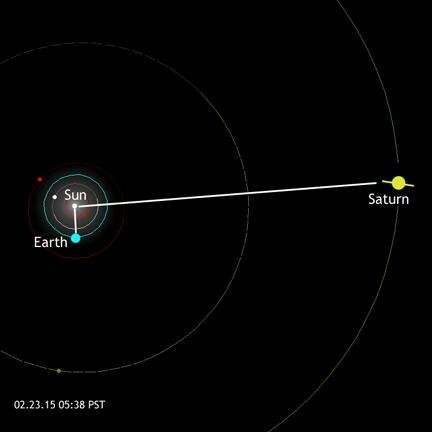 Today also marks Neptune’s conjunction. 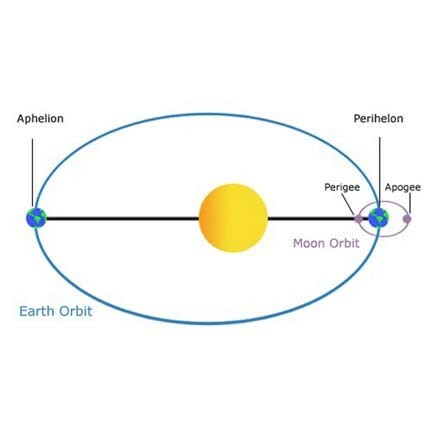 It is on the opposite side of the sun from the earth. Everyone loves a two-for-one deal, and here’s one to start your day with. The constellation Hercules is up in the east before sunrise. You can make out its shape above the bright star Vega (in Lyra). 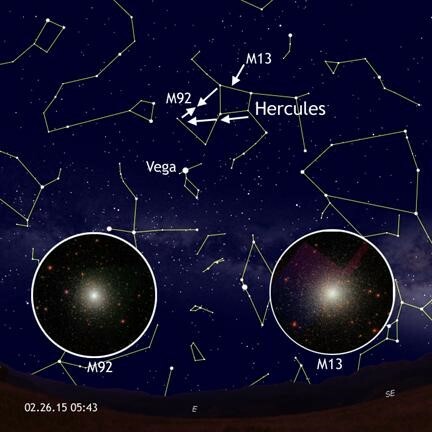 It contains two great globular clusters, M13 and M92. They are easy to find in binoculars using the “keystone” shape of Hercules’ body. M13 is 2/3rd along one side of the keystone. Using the other side of the keystone, hop twice that distance to a star, then go about 1/3rd the way back toward the top star in the keystone. Both giant globular clusters are about 25,000 light years distant. The summer constellation Scorpius is up nicely in the morning skies. 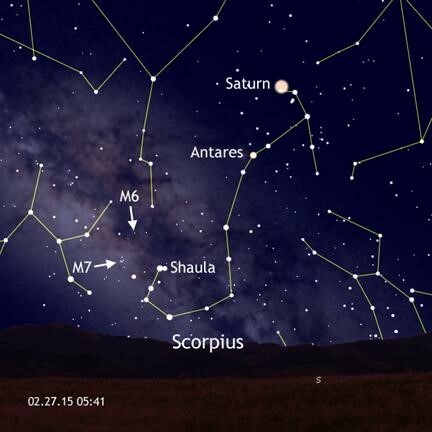 Saturn is in the same field of view as the multiple star Nu Scorpii. 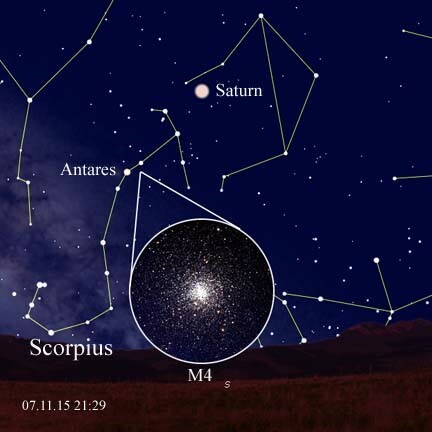 Antares burns red as the heart of the scorpion. The stinger is easy to imagine as the stars Shaula and Lesath. Nearby are the binocular objects M6 and M7, two lovely bright open clusters in the heart of the Milky Way. 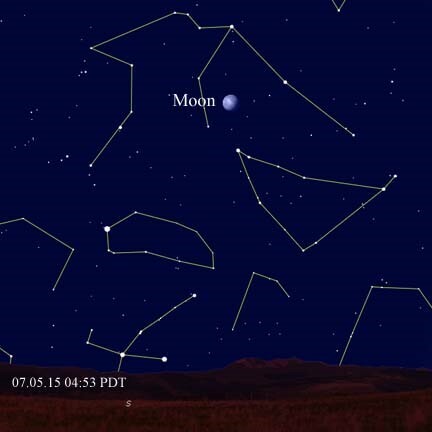 The Moon now dominates the evening sky, growing in waxing gibbous phase and 82% illuminated tonight. Its brightness will obliterate our view of the winter Milky Way running between Orion and Gemini. 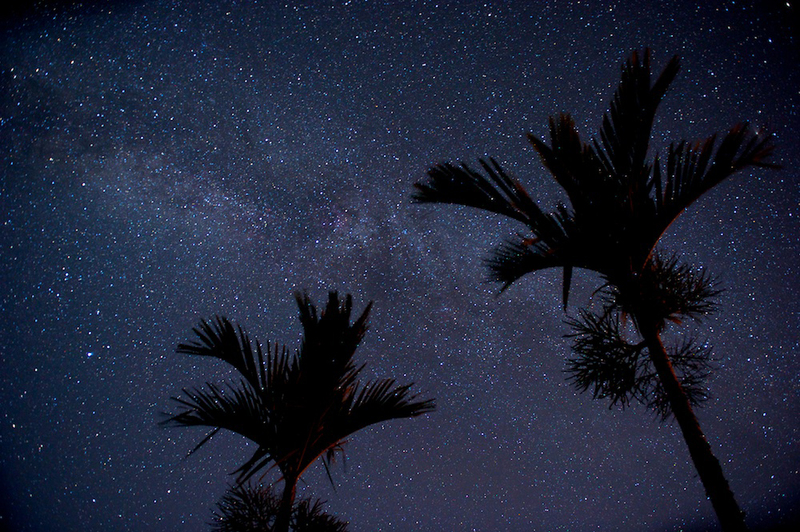 Only the brightest stars and Jupiter will be visible in the nearby constellations. 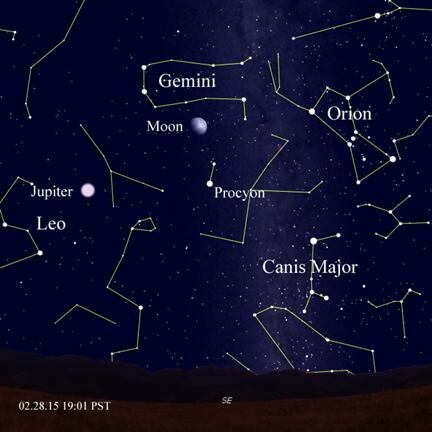 Look for Procyon in Canis Minor – it shines at magnitude 0.37. Can you spot it with a bright moon so nearby? If your eyes could only see the color red, this is how Saturn’s rings would look. Many Cassini color images, like this one, are taken in red light so scientists can study the often subtle color variations of Saturn’s rings. These variations may reveal clues about the chemical composition and physical nature of the rings. For example, the longer a surface is exposed to the harsh environment in space, the redder it becomes. Putting together many clues derived from such images, scientists are coming to a deeper understanding of the rings without ever actually visiting a single ring particle. 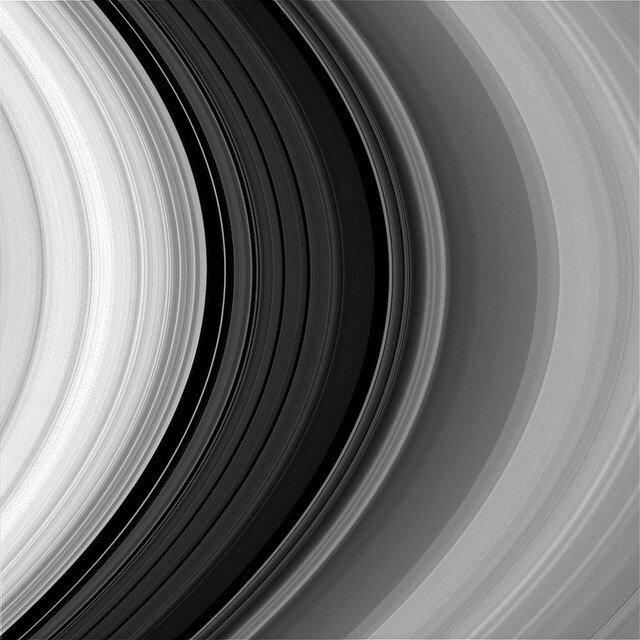 This view looks toward the sunlit side of the rings from about 11 degrees above the ringplane. The image was taken in red light with the Cassini spacecraft narrow-angle camera on Dec. 6, 2014. The view was acquired at a distance of approximately 870,000 miles (1.4 million kilometers) from Saturn and at a Sun-Saturn-spacecraft, or phase, angle of 27 degrees. 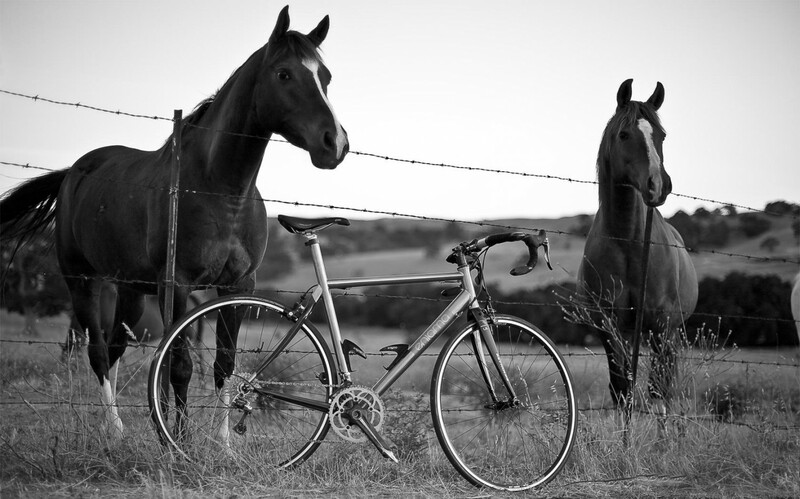 Image scale is 5 miles (8 kilometers) per pixel. This is an artist’s conception of the extrasolar ring system circling the young giant planet or brown dwarf J1407b with Saturn and its ring system to scale (in upper right quadrant). The rings are shown eclipsing the young sun-like star J1407, as they would have appeared in early 2007. The best fit model is consistent with a system of at least 30 rings, and there are gaps where satellites (“exomoons”) may have already formed. They might, that is, if they’re really seeing rings. “I keep telling people, ‘if you can think of a better explanation, please let me know,’” Mamajek says, and he means it. So far, he has no takers. “The signal is very strong,” says Harvard’s David Kipping, who is doing his own search for exomoons, “and its difficult to believe the instrument could misbehave on such a huge scale. I think many of us find the signal interesting,” he says. That, by itself, is enough to keep the astronomy community looking. Lots of Waving Going On! 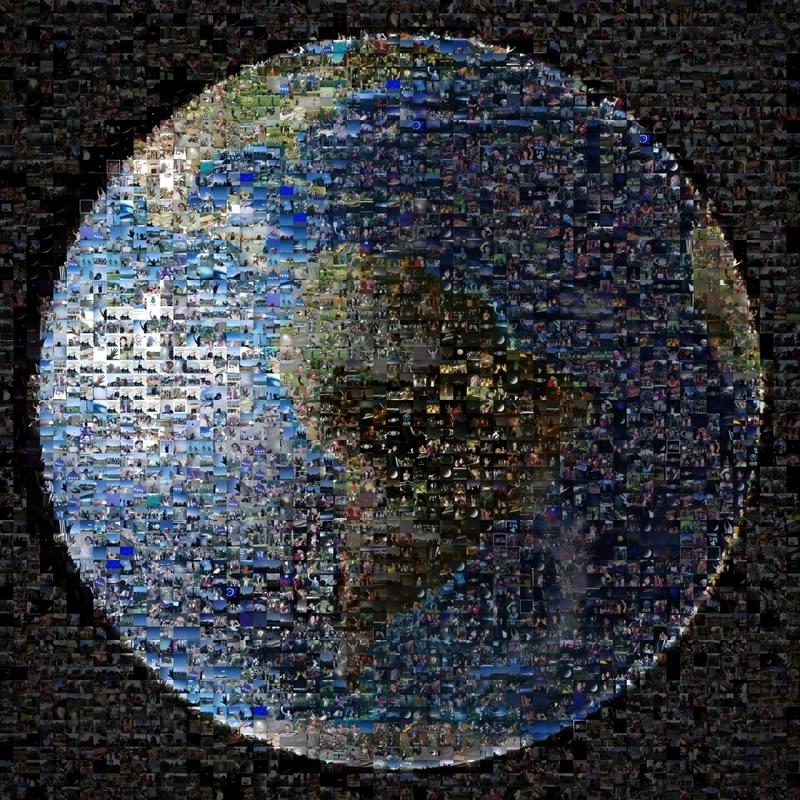 This mosaic is made up of 1400+ images of Earthlings waving at Saturn, in celebration of the July 19 Cassini spacecraft photo shoot of Earth and Saturn’s rings. 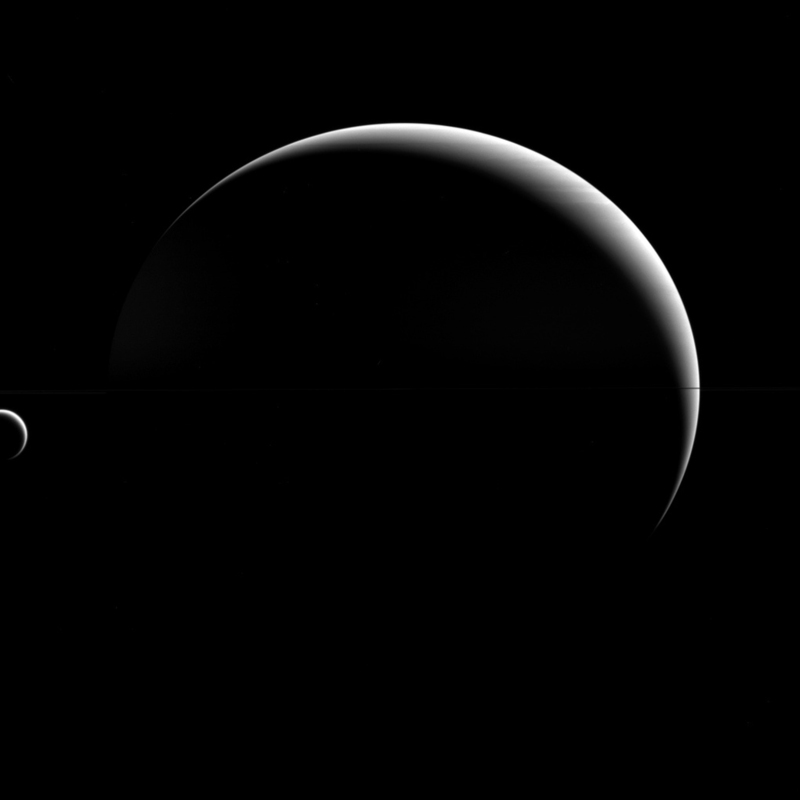 SATURN will disappear into the sunset twilight in late October, only to re-emerge in morning skies in mid-November.